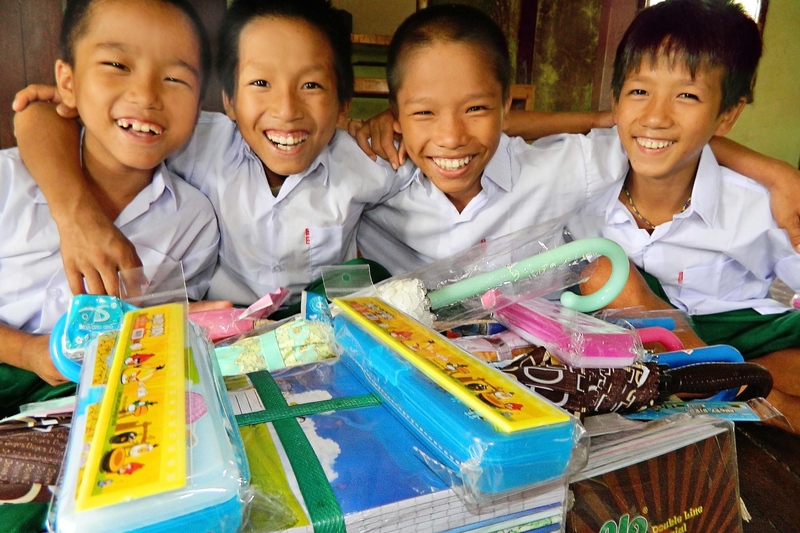 Myanmar: A story of sustainability leading to smiles through education! Photo: Boys at one of our Myanmar orphan homes are happy to receive new school supplies purchased with profits from our farmland enterprise! In Myanmar, our farmland enterprise efforts are empowering orphans who have come from child labor situations. Recent profits from our rice farm and piggery ventures provided the orphans with new school supplies and umbrellas for the rainy season. It’s this model of sustainability in action that makes our programs more than just a rescue operation. We go beyond rescue to rehabilitation and restoration, through education and proper equipping and through providing the orphans with loving, nurturing home environments. Thanks to profits from our 12-acre farmland and piggery project, our native team is able to send dozens of orphan children to school with the right supplies and resources needed to ensure a proper education. Fresh ingredients from the farmland greatly assist in providing over 300 meals daily to the orphans and staff in four different homes in the country. As you can see in the story photo, these children are extremely happy and grateful for the chance to attend school, as they come from backgrounds that would never have afforded them such an opportunity. Thanks to the profitability of our farmland ventures, our native team has been empowered to better care for these children, ensuring their education, clean living environments, hygiene supplies and medical attention. Several of the students continue to excel in their schools—many receive awards and scholastic honors. One can only imagine the exponential impact these children will make in the world as they eventually graduate and go on to lead successful, productive lives. Our aim is to provide a nurturing family-based environment, coupled with a strong eduction, to send them into the world ready to impact society—to spread the same principals of God’s love our native teams are pouring into them.